Join us as we celebrate our 45 Year Class Reunion! We'll enjoy a delicious dinner, performances by our amazing EGHS '74 Reunion Pep Band (back by popular demand! ), great music by our own Debbie Schussman Bailey, DJ of Mountain Mama Music Productions, dancing, some SURPRISES, and have a wonderful time reminiscing with old friends and making new ones. CUSTOMIZED DINNER BUFFET MENU: Customized Dinner Buffet Menu Includes Marinated Skirt Steak, Parmesan Chicken, Pasta Primavera, Seasonal Fruit Platter, Mixed Green Salad (with assorted toppings), Mashed Potatoes, Seasonal Vegetable, House-made Bread, Brownies and Cookies. LIMITED TICKETS: Tickets will be sold through Eventbrite ONLY. Tickets will NOT be available at the door. Once we sell out (as we did in 2014) we'll begin a Waiting List (for tickets released back to us). Get your Reunion Tickets NOW and enjoy our Early Discount at only $65 per person! 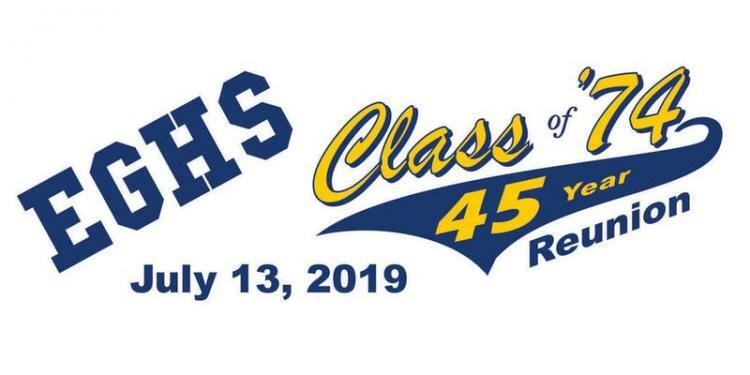 JOIN OUR REUNION GROUP ON FACEBOOK: If you're on Facebook, please type in "EGHS Class of '74 45 Year Reunion GROUP" in the search bar and request to join our Reunion Group. It's a great place to get connected with our classmates before the Reunion! PUBLIC AD: Please visit our public Facebook AD Page, "Elk Grove High School Class of '74 45 Year Reunion". You can use the Facebook AD Page link located in the "Organizer" section of this Eventbrite Web Page or type the exact name into your Google search bar. MUSIC: Music will be provided by Mountain Mama Music Productions, featuring our own Debbie Schussman Bailey as DJ! We hope you're able to join us! Your presence will help make this Reunion special! See you Saturday, July 13th!